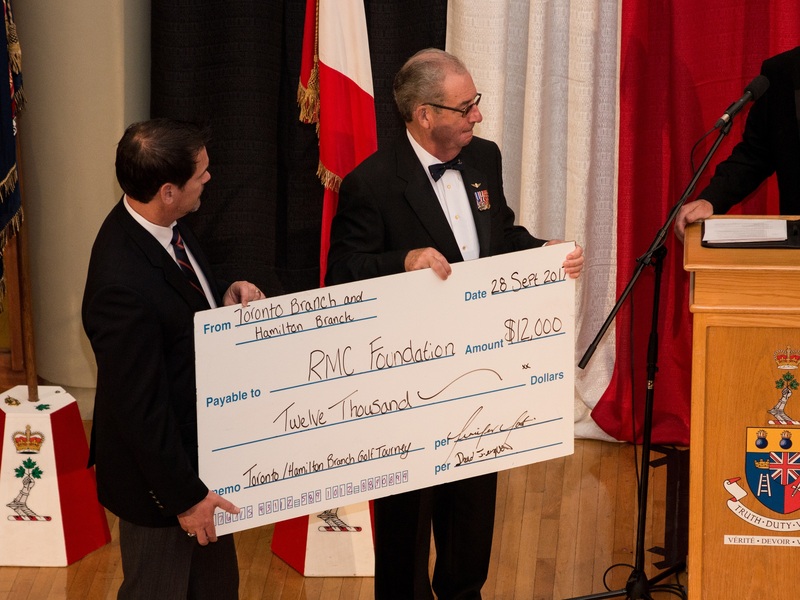 “The mission of the RMC Foundation is to secure and deliver the funds necessary to Enhance Excellence in the attraction, education and training of the students of the Royal Military Colleges. 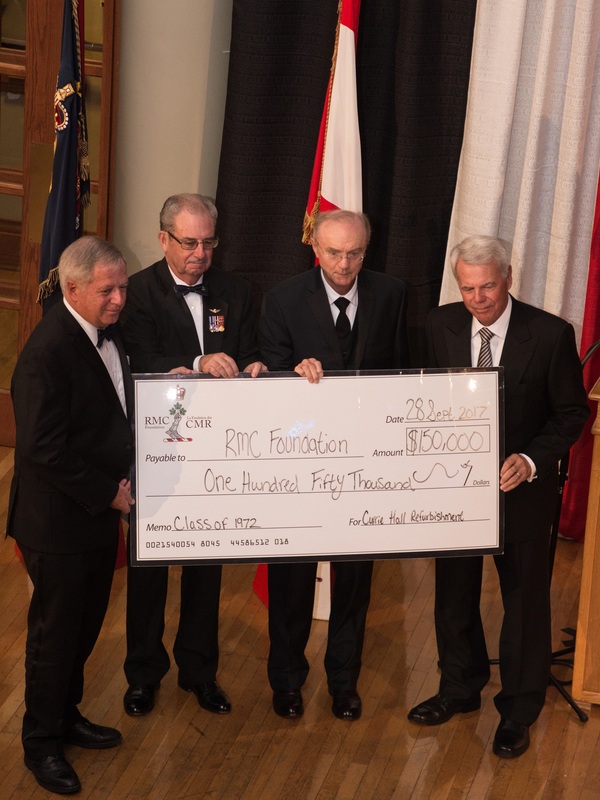 The 20th annual Legacy Dinner held on Thursday 28 September, 2017 was once again a resounding success, due largely to the long hours and outstanding effort of the staff of the RMC Foundation. In addition there were numerous individuals and groups at RMC who contributed immensely to the kick-off event to the 2017 Reunion Weekend. Our sincere thanks go out to all who assisted in making the Legacy Dinner such a huge success, in particular our Platinum Sponsor Canso Investment Counsel Ltd. and our Silver Sponsor TD Canada Trust. 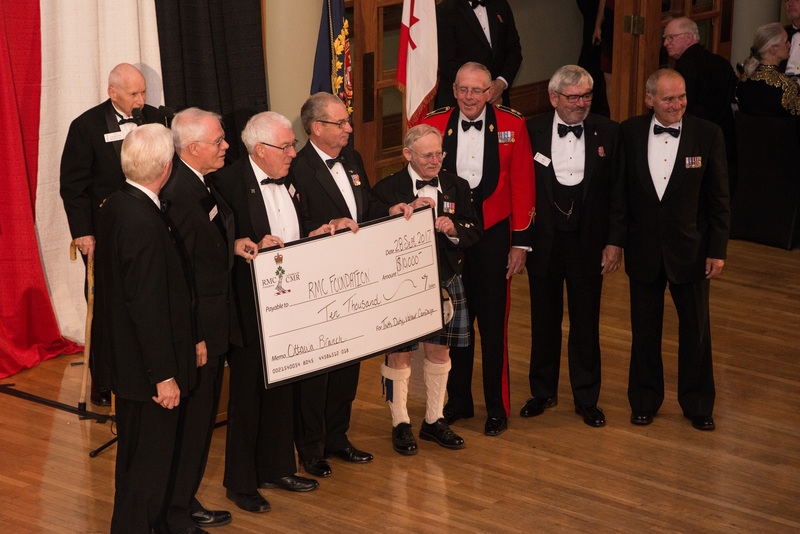 The Commandants from both RMC and RMC Saint-Jean attended for the first time and witnessed significant donations by The OB Class of 1972, La Corporation du Fort Saint-Jean, 22031 Francis Leung, the Toronto/Hamilton Branches and the Ottawa Branch. Notable attendees such as H7543 Senator Joe Day, The Honourable Carla Qualtrough and 13738 Chris Hadfield were in attendance as well as over 70 Cadets from both Colleges enjoying the revelry of the ex-cadets and their guests. Photos below tell a pretty nice story. 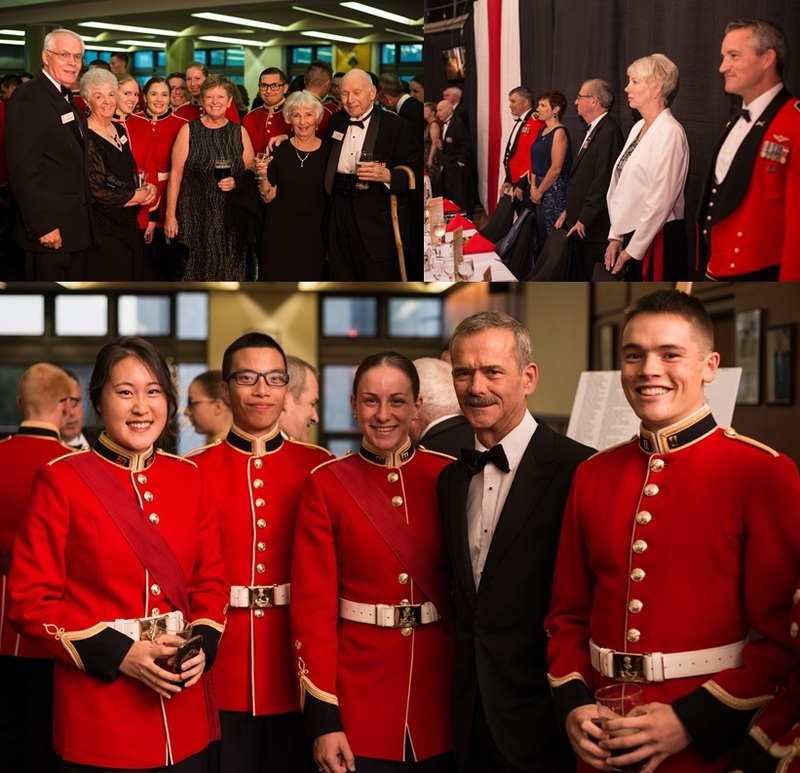 On Thursday night, I had the pleasure of attending the Legacy Dinner for the first time in my RMC career. The high profile event, which provides current officer-cadets with the opportunity to interact with notable RMC graduates, marks the beginning of Reunion Weekend. The evening began with cocktails and hors d’oeuvres in the formal side of the Cadet Mess. This gave the Cadets, who were dressed in scarlets, time to chat with the dinner’s generous donors. I had the chance to meet the Commander of Military Personnel Generation, Rear-Admiral Luc Cassivi as well as RMC Grad and retired astronaut Chris Hadfield. Afterwards, we were ushered into the New Gym, which was elaborately decorated, for our meal. In proper military tradition, the event resembled a mess dinner and was complete with a flag party, band and pipers. I sat at the table sponsored by the Toronto Branch and was lucky enough to be hosted by 17160 Mr. Stephen Kalyta, the Branch’s Vice-President. Throughout the night, Mr. Kalyta told us stories about his time at the College, in the forces and of his subsequent professional life. The retired Logistics officer currently has a son in first year. The night ended with the usual toasts and departure of the flags. Overall, the Legacy Dinner was a fun night and a great event that bonds ex-cadets to the current generation of up and coming officers. 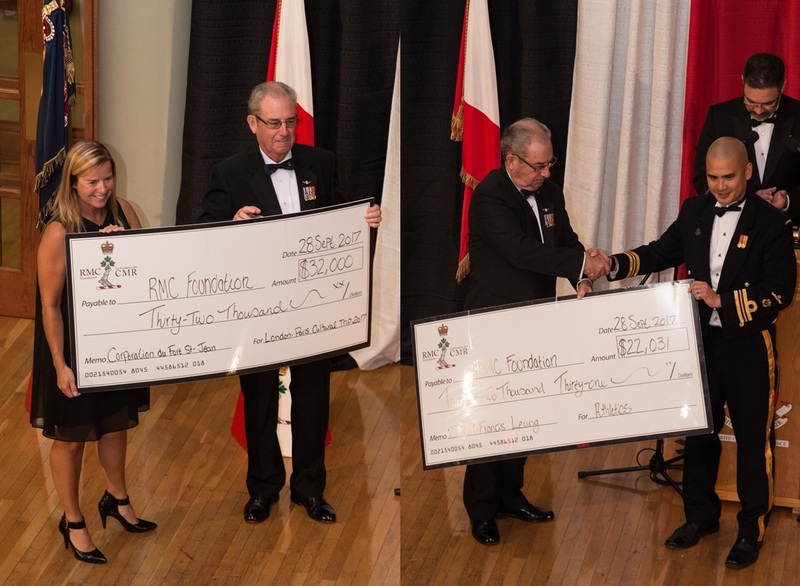 La soirée du 28 septembre 2017, les élèves-officiers et les anciens du Collège militaire royal du Canada se sont rassemblés pour célébrer l’occasion du vingtième dîner Héritage de la Fondation des CMR. Parmi les invités se trouvaient l’astronaute H13738 Chris Hadfield et le sénateur H7543 Joseph Day. Somme toute, entre les histoires enjouées des anciens, les mets savoureux et de la musique bien divertissante, la soirée fut d’une grandeur indéniable. Merci infiniment à la Fondation des CMR d’avoir arrangé ce dîner et merci à la branche de Toronto du Club des CMR de m’y avoir invité.